What’s For Snack? 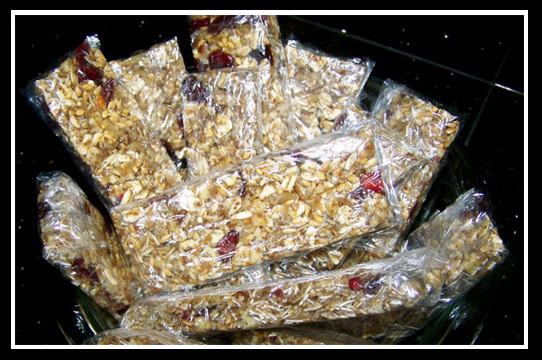 Homemade Granola Bars! Homemade granola bars are one of the BEST discoveries I’ve made in the past year or so. They are less expensive than their store-bought counterparts, more healthy (or at least you can make them as healthy/unhealthy as you so choose), and a heck of a lot more tasty! Back when I was on the hunt for a delicious, nutritious, homemade granola bar recipe I came across a lot that still had all the ‘un-nutritious’ ingredients I was trying to avoid. And then I finally came across THIS recipe, and after reading through some of the rave comments for them, I decided these had to be worth a shot. And seriously! They’re so good! They’re way better than what you buy in the store, cheaper, a lot more healthy, AND I can have them in my food storage! Is there a down side to this?! …other than that now I will be having to make my granola bars instead of spending two seconds to throw them in my grocery cart? 🙂 But actually, that’s half the fun too! And really it is, because this recipe is so versatile that you can customize it to be pretty much anything you want! Mix the oats, nuts, flax seed, wheat germ, and coconut on a baking dish (with sides) and toast them in the oven for about 12 minutes, stirring about half way through so that they don’t get burned. Put the brown sugar, honey, butter, vanilla, and salt into a saucepan, then turn the heat on to about medium-high and bring it to a simmer, stirring constantly. Once it comes to a simmer and the top is covered with bubbles, remove it from heat (you don’t want it to boil for more than about 30 seconds, otherwise you’ll end up with crunchy granola bars). And your grain/nut mixture should be done now too, so take it out of the oven (and you can turn the oven off too… we’re done using it). Throw the toasted mixture into a large bowl and pour the melted mixture on top, along with your dried fruit. And mix, mix, mix. Mix some more. 🙂 You want to make sure that everything gets coated with the “gluey” syrup. Dump your granola mixture into the prepared baking dish. Spread it out as evenly as possible. Using another piece of parchment (or wax paper, but again, watch out for sticking), press down HARD all over the top of the granola. You want to compact it together so the bars won’t fall apart when you cut them. Wait 2-3 hours, or until the granola has completely cooled. Turn the granola onto a large cutting board and peel away what is now the top layer of parchment paper. Cut the granola into bars by firmly pressing down with a big cutting knife (not sawing). You can make the bars whatever size you like, but if you make them the general “granola bar” size, you should be able to get 18-22 bars out of this. Finally, you can either wrap the bars individually in plastic wrap** so they’re ready to grab and go, or you can just store them in an airtight container (with a piece of parchment placed between any layers). 1) Make sure your nuts are finely ground. I put mine in a food processor and get them down to tiny chunks (half of it almost ends up in a powder). Large chunks of nuts will make your granola bars more apt to fall apart. 2) In step #4, turning the heat on after the ingredients are all in the pan is a trick I developed to help keep the sugar from cooking longer than the rest of the ingredients–which would turn the granola bars a bit more crunchy and crumbly. 3) Press down HARD once you’ve got the whole mixture spread out in the pan. I usually press for several minutes to make sure it is completely compacted together. Thanks for this recipe and detailed instructions. I made these and they turned out great! Better (and more healthy) than ones I’ve made before. The only change I made was adding mini chocolate chips (gotta compete with the Quaker bars my kids love!) They melted, however, as I stirred them in. Maybe I’ll sprinkle them on top next time. Hey Kami! Glad you liked them. I really enjoy them too. 🙂 Re: the melted chocolate chips, I had read several reviews on the original recipe I tweaked this from that had the same problem, so I never bothered trying it with the chocolate chips. Luckily for me, my kiddos are small enough that they didn’t get attached to the store bought kind before I switched to making the homemade kind. So they don’t know any better. 😉 Anyway, if you come up with a good solution I’d love to hear it! Thanks! These granola bars sound wonderful and I can’t wait to try them! I wanted to share a tip I learned from my son (now 17). He makes granola bars once a week, cuts and freezes them to use for breakfast each morning. He found that his bars compact well if he uses an old-fashioned potato masher to press them. Yep, works like a charm, and makes the dough even in the pan, too! What’s the shelf-life, do you know? Do you have to keep them in the fridge?